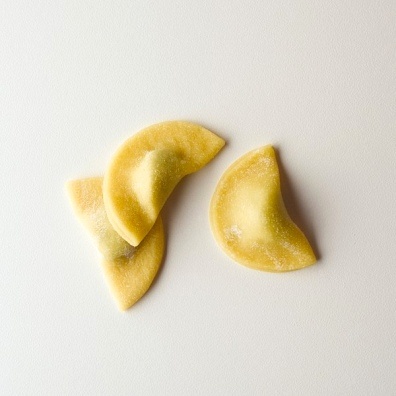 Casunziei is the name in a North-Eastern Italian dialect for a kind of filled fresh pasta, consisting of a filling sealed between two layers of thin pasta dough, folded in a typical half-moon shape. They are commonly home-made and are typical of the culinary tradition of the Dolomites area, in the north-eastern part of Italy, especially the provinces of Belluno, Vicenza, and Verona. The square shell, typically about 3.5 by 3.5 cm, consists of two sheets of pasta pressed together at the borders, like those of ravioli. The pre-cooked and finely ground filling varies from area to area and typically includes vegetables and ricotta cheese. The original recipes are the "red" variety (casunziei rossi) with beet, potato, and red Veronese turnips; and the "green" one with spinach, the wild-growing erba cipollina in the filling. Other varieties have fillings of pumpkin or radishes. The filling may included other ingredients such as ham, mushrooms, other kinds of cheese, poppy seeds, etc. In particular, the casunziei all'ampezzana have a filling of red and yellow turnips and are typically served with melted butter, poppy seeds, and Parmesan cheese. Other servings are sage-flavored melted butter, or a radish-based sauce. Recipe using Casunziei see Here, Here and Here.